The perfect portable beat machine. Inspiration can happen anywhere. The XR20 is loaded with pro-grade, industrial-strength drum, percussion, bass, synth, sound effects, vocal and instrument hit sounds and has the ability to lay them in a groove wherever and whenever you're ready. "The good bad and ugly"
Sound: Drum machines, especially items such as the StreetBox and the XR20 are tough sells in the age of samplers. While the XR20 has 700 sounds, each of which can be tuned higher or lower, you're still stuck with those 700 sounds. I honestly wasn't overly impressed with the sound palette. The first night I had the machine, I sat down and worked through all of the sounds and put my own kit together. The sad part about this is, I had trouble picking 12 sounds for my custom kit...not because there were so many great sounds, but because I felt there were so few. The XR-20 is setup with 3 channels of MIDI, "Drums, One Shots and Synths". Some of the one-shot sounds are pretty nice, but there aren't enough of them to be very flexible. They give you two guitar chords when you wish you had 3 or 4. The downside to these one-shots is that they'll be overused and outdated in notime. Leaving you with a machine where only the Drums and Synths are useable. The synths are OK. They aren't groundbreaking or especially exciting. Comparing the selections of sound in the XR-20 to the venerable Boss DR-5...the Boss wins hands down. Then again, the Boss retailed for around $500 more than 10 years ago...so given the price of the XR-20 I guess it's ok. Feature: I've owned a few drum machines in my day, Sequential Circuits, Roland, Boss...but the XR-20 is the first Akai machine I have owned. 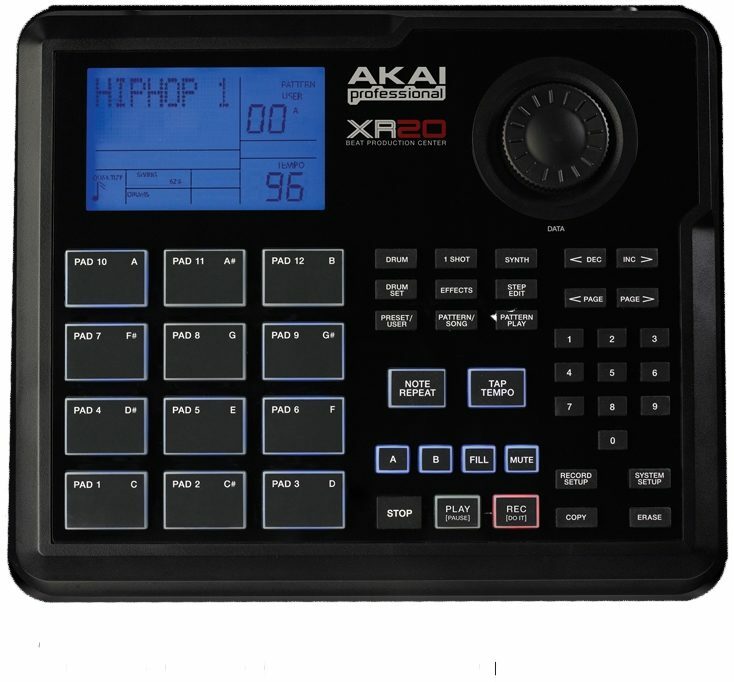 The XR-20 has all of the common features in a drum machine that you've come to expect. You can tune each sound to your liking, you can put together your own kit of the sounds you like. I think where the machine really excels is in the Akai sequencer. Akai has made a name for itself with the MPC series of samplers/sequencers. I've never owned an MPC so I can't say that the XR-20 is LIKE an MPC sequencer but I'd imagine that it is. Obviously you can adjust your quantize to wherever you want it. The unit has a "swing" feature that works alright in some situations. But there is something about how this unit sequences that give the drums a certain natural groovy feel when compared to a 100% software sequencer like Cakewalk Sonar. Another feature that I have grown to love is the "repeat note". I use it frequently when laying down hi-hats, to minimize the wear and tear on the pads and also to keep everything in-time. You can come up with some ridiculous hi-hat riffs using the repeat function. The way the XR-20 stores patterns is in an A/B + FILL configuration. So you can easily pop between pattern A and a variant pattern B while also throwing in a FILL whenever you want. I'm not sure how useful this is in the studio...it might be geared more towards a live DJ who incorporates some of his own beats into the set. As someone else already mentioned, the pads are backlit with a nice neon-blue color. They flash when the pad is pressed or sequenced. This looks really flashy and impressive, but it's not overly useful. It would look great next to a DJ on a live set. enough on that... Ease of Use: The unit is fairly easy to operate. Many of the menu buttons are dual-purpose and serve to toggle between one type of menu or the other. I found this to be a little confusing at times and it's probably just a situation where I need to adjust from one machine to another. I'm not particularly fond of how the XR-20 measures out its' pattern length. It has a default of 8 which is actually 4-4/4 measures. Dropping it down to 4 turns the pattern into 2-4/4 measures. I'm not sure of the logic here and I haven't bothered trying to understand it yet...but be aware. Quality: The unit seems fairly well built. I am a little concerned about some of the smaller menu buttons and how long they'll hold up to abuse. On the flipside, the DR-5 is still going strong after all of these years and the XR-20 actually seems better built than the DR. In any case, I'd still be careful with the unit. Value: I put the value at about the halfway mark. For some people, $300 is not alot of money to spend on a new piece of equipment...for others, that $300 investment needs to last. When I say "last", it's not only the physical aspects of the machine, but the sounds that it makes. Will the sounds in the XR-20 be as useable today as they could be in 5 or 10 years? NO. This is where the XR-20 falls flat on its' face. I think this machine will be pretty darn good for the next couple of years, but if you are very serious about making beats, I'd recommend holding out and getting yourself an entry level sampler. Manufacturer Support: I haven't needed to contact Akai support for any reason so I cannot comment on this. The Wow Factor: It's a decent piece of gear to add to the arsenal. If you're strapped for cash and want a decent machine, you could go with this or maybe buy something from the secondary (used) market. Overall: I can see myself using this machine for years and years to come. Only because I've got it linked up with the DAW so I can lay down some drums on the XR-20 and then pipe the MIDI into the computer and assign different hits in GURU. This is a nice little setup, but it's not perfect. If the XR-20 had 4x4 pads, it would be unbeatable. 3x4 pads is kind of unorthodox. If this unit was lost or stolen or destroyed...I definitely wouldn't rush out to replace it. It's not an integral piece of my workflow. Style of Music: Everything from Rock to Hip Hop and in between. 127 of 138 people (92.03%) found this review helpful. Did you? Sound: Good quality sounds! Make for fun beat outlines and quick beat idea's. I use it conjunction with my MPC 2500 Feature: It is great for a little drum machine. 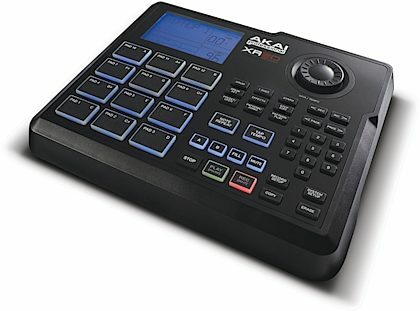 For $299, you wont find a more fun and easy to use Drum Machine! Ease of Use: Simple, I did not read the manual at all, and I got it in less than 30 minutes! Quality: Its Akai/Numark! I have never had beef with them on quality. It is plastic though! It has a shiny glossy black plastic top that will certainly get scuffed up! Value: Awesome fun little unit for $299! I did not plan on getting one, but played with it at GC, and could not resist! Manufacturer Support: Been good to me through the years! The Wow Factor: FUN AS HELL! Overall: Get it, it will make beat making fun! I use for mobile use, outlines and drum tracks in conjunction with my MPC2500LE and Fantom X and Motif XS. It is great to take on trips or wherever, use with batteries and make music where I did not b4!